MEALS FOR A HEALTHY 2017! ShopRite teams up with the NFSB Food Pantry on Thursday, January 26th, at the NFSB Annex, 169 Chestnut Street, Nutley, NJ 07110. 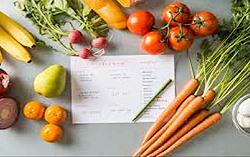 Dietitians from ShopRite of Nutley and Belleville will be demonstrating how to prepare cost effective and easy ways to boost the flavor and nutrition in your family meals featuring seasonal grocery items. Please RSVP at the Food Pantry in person or by phone (973) 542-8276 or at the NFSB Main Office (155 Chestnut Street). Event is free and includes Grocery Bag Give-Away! The issues impacting men in the established years of their lives, may be overwhelming: balancing work, marriage, family, children, aging parents, and additional pressures. There are too many responsibilities with too few resources and little support. Men easily can lose the essence of who they are as males and individuals. Men are stronger than they may think, and do not have to "go it" alone. They can benefit by both raising self-awareness and making common connections with others. Come join us for this 8-week group for men, age 30_60, that will be led by Joe Armentano, Licensed Clinical Social Worker and therapist at NFSB. For more information and to register, Please call (973) 667-1884. Volunteers play a key role in supporting NFSB's dedication to mission. 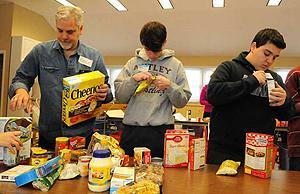 Volunteers are all ages, from teens to seniors. They bring a wealth of enthusiasm and commitment to their efforts. The essential qualification for NFSB volunteerism is a desire to make a meaningful contribution to the community through the agency's social service operations, primarily the Thrift Shop and Food Pantry. NFSB appreciates the time and energy that every volunteer puts forth to helping the agency make a positive impact on the well-being of individuals and families in the community! Tricia Politi, LCSW, Nutley Family Service Bureau therapist, is also a wife, mother, daughter, sibling, friend and volunteer. Invest in yourself. Investing in yourself does not require a financial commitment, but rather is an act of love and self-care. Set aside time to do something that inspires you. Pursue an outlet that will bring meaning to your life. Say no to requests and demands on your time that leave you feeling depleted. If you want to make a major change in your life, break the process down into manageable steps and be patient with yourself as you make progress toward your goal. Forgive yourself when you encounter setbacks. Allow yourself to experience the journey with as much peacefulness as possible. Speak to yourself with the same loving words you would use with the person you care about most. Invest in others. When the problems of the world seem too overwhelming, "double -down" on the people and relationships in your life that matter most to you. While it is impossible to shut out the often-harsh realities of modern life, instead of giving up, invest your time and energies on those you love and care about. If you have fallen out of touch with a friend, reach out and reconnect. If you are holding onto negative feelings with someone, find it in yourself to forgive and move ahead with a more positive attitude. No one has ever said, "I wish I had fewer friends!" Invest in your community. While we may feel powerless to effect change in the world, the place where we can make a significant difference is in our communities. Whether it is by volunteering at a soup kitchen, food pantry, or thrift shop, or fundraising for a local charity, or simply by routinely responding with kindness to those who are struggling - we can make a significant impact in the lives of our neighbors. Investing in community, not only benefits others, but is beneficial on a personal level as well because it creates empowerment. When we feel empowered, we cannot help but feel good. When we feel good about ourselves, we feel hopeful. When we have hope, wider horizons open to us. By investing in ourselves, in others, and in our communities, we create meaning in our lives and make sense of the world around us. These investments can yield long term dividends if internalized and maintained throughout one's life!